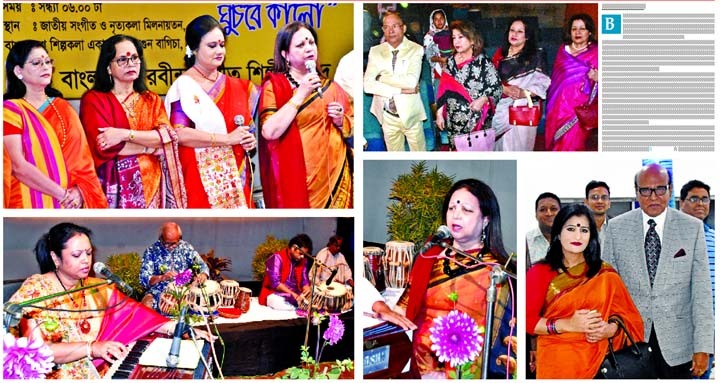 angladesh Rabindra Sangeet Shilpi Sangsad organised a Tagore song evening titled Drishti Hotey Ghuchbey Kalo at National Music and Dance Centre Auditorium of Bangladesh Shilpakala Academy in the capital recently. Eminent lawyer and Advisor to the BNP Chairperson Khandaker Mahbub Hossain, Chairperson of The New Nation Saju Hosein, President of Rabindra Sangeet Shilpi Sangsad Dr Farhat Hossain, its General Secretary Mojibul Quayum, Shahnaz Hossain, Nasrin Kader, among others, were present on the occasion. In the programme, Dr Farhat Hossain, Nahar Jamil, Mojibul Quayum, Fahim Hossain Chowdhury, Swapan Dutta, Mezbaul Alam Monju, Iffat Ara Dewan, Badrunnesa Dalia, Hashi Biswas, Shorful Alam, Roquaiya Hasina, Baitun Nahar Popy, Timun, Sarwar Hossain Babu, Adrita Anwar, Milon Deb, ATM Jahangir, Rita Majumer, Bulbul Moholanobish, Bornali Biswas, Kanchan Mostafa, Suporna Das Mitu, Nusrat Binte Nur, Nasrin Rosy, Md Sadeque, Nilotpal Shaddo and Purobi Biswas rendered Tagore songs. Their performances enthralled the audience.